Travelers to San Miguel will treasure their stay at Casa Parque. This luxurious house is situated on a quiet, very private street in an enclave of upscale homes just south of Parque Jaurez. Many say, “This is the best street in San Miguel” The house is flooded with sun and the sounds of doves. The Jardin is only a 10-12 minute walk. The rooms are all spacious and the 3 bedrooms are all very private. The house has a TV room with a large flat screen TV with cable. High speed internet provides wireless connectivity in the study and throughout the house. The kitchen is large, light-filled and fully equipped with a fridge, stove, dishwasher, and microwave oven. A high-end filtration system provides pure water throughout the house. There is also a private, enclosed driveway. 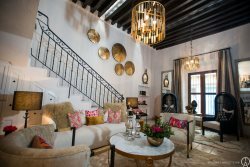 All these up-to-date features harmonize with the architectural beauty of a new home that is built along a century-old wall , which forms part of its structure. The first floor includes the large kitchen with a family room area with gas fireplace, a separate dining room, an elegant living room with fireplace and a very private guest room (twin beds) with an ensuite bath. 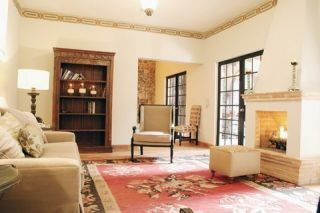 From the living room you walk out into a loggia graced by lovely stone columns and another gas fire place. This is a wonderful place to sip your morning coffee, enjoy lunch at the stone table, or simply read. You’ll also delight in the tiered garden and fountain – as you watch hummingbirds visit the flowers. The second floor has the master bedroom with its king-size canopy bed and gas fireplace. The master has “his and hers” bathroom s as well as an enormous walk-in closet. The master also has two sets of French doors that open onto a terrace where you can bask in the morning sun. There is a full study behind the bedroom. The second floor also has a very private guest room with a canopy bed (queen sized) and an ensuite bath. A rooftop terrace provides breathtaking, panoramic views of San Miguel. An excellent staff will make you feel you are in a luxury hotel. Theresa, the maid, comes three times a week to clean the house only. She can cook a meal for an extra fee. Our house manager is responsive to all requests, and our gardener looks after the many flowers during his several visits each week. The night watchman is monitoring the gate from 6 pm to dawn. In short, this is the ideal house to assure that you have a wonderful vacation in San Miguel.